The other day I stopped off at Whole Foods on my way home from work to gather something quick for dinner. It was already pushing 6pm and I am usually home and have most of the dinner prep work completed by this time in the evening. Perhaps a caesar salad and something else from the deli would suffice. I walked through the door and the fresh yellow and white corn display brought me to a sudden halt. I could just pick up a few ears to add to the salad idea, but no, my first thought was corn soup! I considered bringing the corn home, look into a soup recipe and make it for dinner tomorrow. Well, knowing corn needs to be prepared the same day you bring it home I decided to step aside and search for a corn soup recipe, right then and there, in Whole Foods. (thank goodness for smart phones) After glancing through the ingredient list from several recipes I found this fresh, spicy, naturally creamy corn soup recipe on Epicurious. I gathered the few ingredients I needed and headed home. Simple enough. Adapted from Epicurious (reprinted with permission from Simply Mexican by Lourdes Castro). Preheat your oven to 450°F. Ask someone to “shuck” the corn for you while you start to clean, peel, chop, dice and grate all of the ingredients. Put the corn on the cob on a parchment lined baking sheet and brush with olive oil, sprinkle salt and pepper and roast for 30 minutes until corn turns a golden brown. Remove the corn for the oven and allow to cool. Slice the corn kernels off of the cob and set aside. Combine the oil and garlic in a soup pot over medium heat. Once the garlic is aromatic add the onion and jalapeño. Season with salt and pepper and sauté until the vegetables are soft and translucent, about 5 minutes. Add the corn to the pot and using a hand blender puree until it has a smooth texture. Turn up the heat to medium high and slowly add the stock to the pot while stirring. Bring to a boil, lower the heat to a simmer and allow to cook for 15 minutes. Combine the roasted corn, red onion, cilantro, lime zest, lime juice and jalapeño in a bowl and mix well. Gently stir in the avocado. Season with salt and pepper. Ladle the soup into bowls. Place a generous spoonful of the guacamole in the center of each bowl and a sprig or two of cilantro. Serve right away! 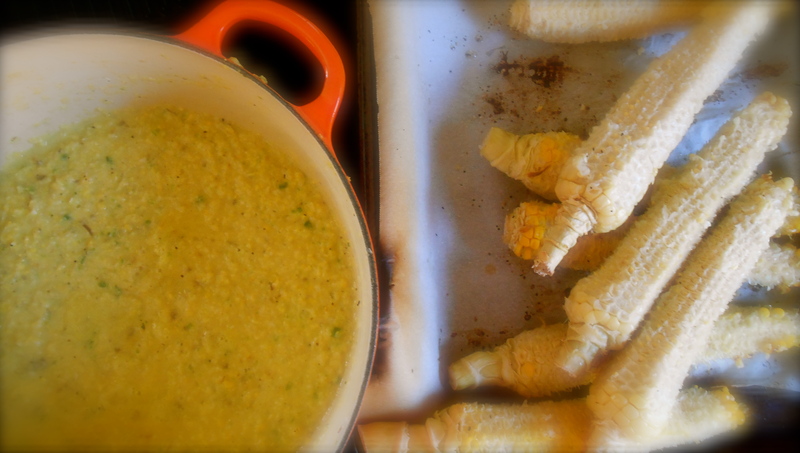 After preparing this soup I learned it is better to remove the kernels from the cob before roasting them. Not only is this quicker because you do not have to wait for the corn to cool off before slicing the kernels, but it also helps caramelized the corn during roasting which intensifies the flavor of the soup. After cutting the uncooked kernel off of the cob toss in olive oil, salt and pepper and scatter onto a parchment lined baking sheet and roast for 20 minutes in a 450°F oven. Your soup (and the guacamole garnish) seems absolutely delicious! Corn looks delicious as does the recipe as always! What a great looking recipe. Brilliant move with the guacamole garnish. Lovely!!! Another bookmarked recipe from your blog! Might make some changes to it but thanks for the inspiration!!! Your welcome! :) Hope your modified version is wonderful. Have a great weekend Felicia! That sounds wonderful. I’ve never been to Whole Foods yet: there’s a giant one in Kensington High St. but I’ve never got there on my rare visits to London. The guacamole was so wonderful! I was wishing we had chips too! Soup was so spicy and good. That corn guac sounds incredibly delicious!! Perfect recipes with all that lovely corn available now. So true. I think a bowl of roasted corn guacamole with some chips is all you need for dinner…the soup was a bonus. Mmmm, that looks/sounds sooo good! I often spot recipes that sound good, but its not so often that I spot one that makes me want to rush to the shops so I can have it for dinner. Thank you! I know exactly what you mean. Every now and then I come across one which creates a sense of urgency. Thank you for your comment! Yum. I love corn soups. This sounds delicious. Thank you… :) I love corn soup too. My favorite soup ! I think corn was made for chowder. I like the additions you made giving it a Mexican flair. This looks incredible. I love corn soups. Something about corn and cilantro together tastes heavenly. I’m going to add this one to my arsenal. Great pictures too! Thank you so much. I agree corn and cilantro really are a perfect match. I really liked the roasted corn guacamole and with a bowl of chips that about wraps up dinner for me! My eyes positively lit up when I read roasted corn guacamole! I would never have thought of it. And I must try a corn soup, when corn cobs aren’t pale and overly priced that is. I’ll definitely take your advice and slice the kernels off first! The recipe said this soup is equally as good using frozen corn. Hmmm. Well, maybe when fresh corn is no longer available I’ll give it a try. You would be pleased with the hot chili’s in this soup. mmmmmm….. Gorgeous! Though I’d happily stop at the roasted corn step. Those ears look amazing. You hit it just right with the roasting. Glad the supper plans worked out despite your time crunch. How gorgeous. A bowl of sunshine. Quite a comfort food! Its fragrance must be quite delectable too! It is good to have some comfort food in the summer…right? This is summer comfort food. Thick, fresh and spicy! I can definitely have this soup and it will make a perfect dinner tomorrow! Thanks for this great idea! Oh good Lidia! I hope you do make it. I made it again tonight. My “guys” love it so much they asked for it again. It was different than the first batch but still lovely. The jalapenos were not quite as heated and the corn was a little sweeter than the first round. Interesting because i followed the same steps…still delicious though! I did make it and oh yum!! Hubby really enjoyed it, as did Charlotte, my 13 year-old. Actually, she loved it, as did I!! I guess your chowder was sweeter because of the corn. I know our corn was mildly sweet, I’ve had much sweeter, and I can’t wait to give it a try with sweeter corn. Thanks so much! I’m so glad you all liked it! I made it a little on the spicy side the first time and toned it down a little the 2nd time I made it, however it’s true the corn was very sweet. We want to have it one more time before corn season is over. Thank you for the feedback Lidia. This is a really good corn soup very similar to a chowder. Very easy to prepare and so delicious. Hope you do try it! Finally home and will catch up on the blogging world after a couple of weeks of intermittent Internet access. Your soup looks lovely and on the three hour drive home from the airport tonight – passed several fresh corn stands so I will soon give your recipe a try. But what I really wanted to say was that I loved seeing Washington again. Mount Rainier, Olympic Peninsula, Port Townsend, Deception Pass, Chuckanut Drive (northern coast). Highlight of my trip – dinner at Toby’s Tavern in Coupeville – fresh mussels out of the sound – local ling. Fantastic atmosphere. I could live on Whidbey Island and just eat local seafood for the rest of my life! Sounds like a wonderful time! I love all the places you mentioned…Deception Pass is gorgeous, and Chuckanut Drive!! I always smile and chuckle when I see that sign. We have spent a little time on Whidbey Island. We stayed in Coupeville on Thanksgiving a few year ago. Didn’t visit Toby’s Tavern (unfortunately) sounds wonderful. Have even been camping on Whidbey too. I’m so glad you enjoyed your time in Washington. You sound like a good candidate to live here! What area do you live in anyway? I’m curious. Actually not so much “what” area do you live in…I do recall you live near Lake Ontario…rather what is your climate like. For some reason I picture it similar to the Pacific Northwest, yet very much colder in the winter. This looks really lovely. It’s funny, but corn is just something I would never think to make a soup with. I really must give it a try – especially with that wonderful sounding guacamole. Thank you Georgina. Even without the soup this guacamole was wonderful. I can see myself adding roasted corn to my guacamole quite often now. However, if you get a chance do try the soup. It is delicious. You are so right about smartphones! I love the sound of this soup. WIth freshly picked corn, I bet it’s wonderful. This corn guacamole is something new for me. I’d love it here, as a garnish, but I bet it would be good by itself, too. 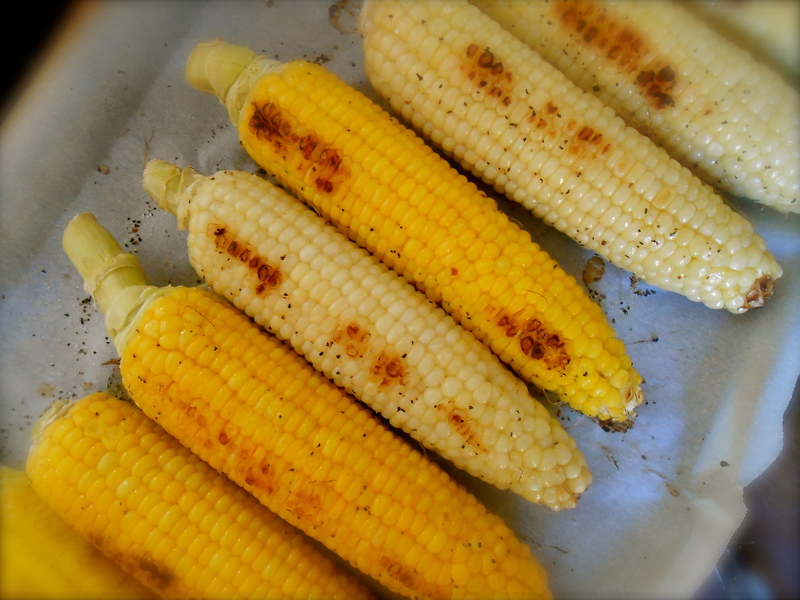 Great tip, too, about roasting the kernels and not the entire cob. If you have an electric knife gathering dust somewhere, you can use it to get those kernels off the cob in seconds. Thanks for sharing. An electric knife would be most helpful! I think the guacamole alone without the soup would be fantastic with a bowl of chips. I’ll be making it again…without the soup. Don’t you just love technology? Smart phones are awesome! You can search for recipes anywhere any time given you have a good mobile data service/WiFi. This looks sensational! 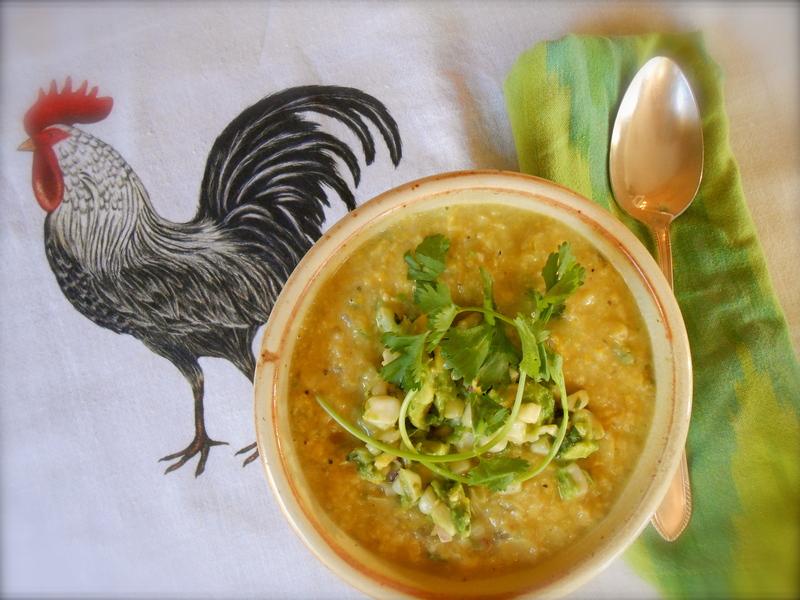 I love fresh corn soup and topped with roasted corn guacamole? WOW! I do love technology….perhaps a bit too much! Certainly is convenient for my shopping list and looking up recipes at the market! The corn soup was sensational. We have had it again since and I’ll most likely visit it one more time before corn season expires. :) yes…it is that good! Thanks you Rhonda. :) Hope you get a chance to give this soup and/or guacamole a try before the corn season expires. I already made it twice in one week…it is that good. This was good and spicy which worked nice with the sweet corn. But then…it’s most likely not corn season in your area. I read this soup is pretty good prepared with frozen corn too. Haha, yes, thank goodness for smart phones! Glad it worked out so well, and this sure looks like a delicious soup! How many times do I turn to the smart phone for answers! I am afraid I may becoming dumber because I rely on the phone too much! :) Nice to have it to look up recipes from the market though! Yuuuum! Sweetcorn is so fab at the mo, I’ve been looking for new recipes for it. This looks great! One of my fave mexican restaurants does something similar! First time I have ever made corn soup because I am not a big fan of corn chowder. However, this soup was incredible. It was so spicy and the texture was fairly smooth considering it was blended. Plus, the roasted corn guacamole was nice to top it off. Can’t wait to try this! Looks yummy! Thank you! Hope you get the opportunity. It’s worth the effort of slicing the corn off the cob, or as I read the recipe I was somewhat following, you may use frozen corn too. Just thaw it out before roasting in the oven. You are currently reading fresh corn soup topped with roasted corn guacamole at COTTAGE GROVE HOUSE.